Instinctively, Anya threw her up her hands to shield her face from the bright light. It reminded her of her step-mother; the way Mary-Anne would always sneak up on her when she least expected it and take a photograph. One time Anya almost broke Mary-Anne’s camera and she had to do extra chores around the house for an entire week. With a half-smile, the old woman in the middle ripped off and slipped the tickets through the slot. “I hope you will enjoy your stay,” she said with a toothless smile. Hesitantly, Anya reached out and took them. “Thank you,” she whispered and turned to leave. But Anya was more interested in the tickets they’d handed her; it puzzled her how warm they felt against her cold hands. She looked around when she heard her name being called and found Miranda and Billy not too far away. She made her way toward them. Miranda storm-stomped at Billy and shouted: “Go ask them why.” Billy shrugged a little, looking uncomfortable, fixing his eyes on the ground, avoiding Miranda’s glare. “How many tickets did you get?” Miranda barked at Anya. “What?” For the first time, Anya noticed a dark look in Miranda’s eyes. “That’s weird,” Anya muttered. “They gave me six…” Something odd caught her attention from the corner of her eye. 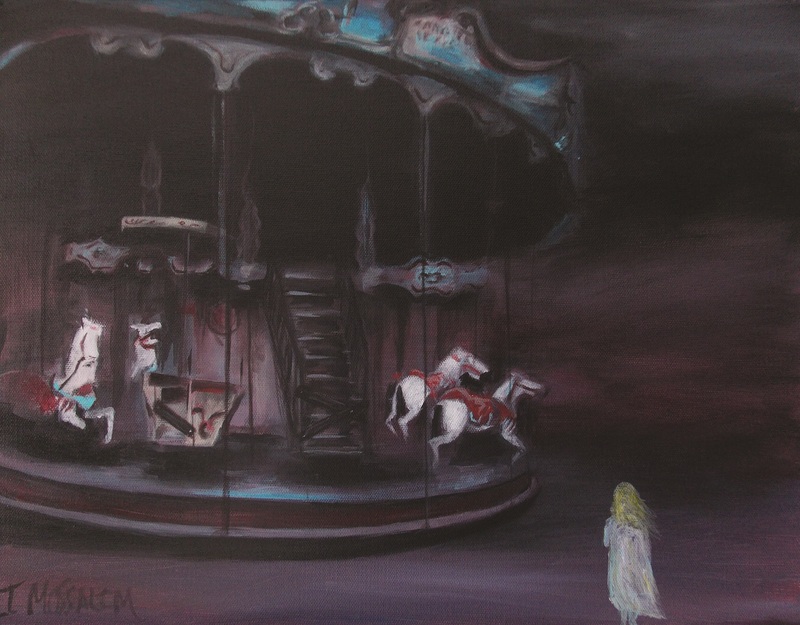 She ignored Miranda’s raging rants and peered behind her where she saw a boarded-up carousel ahead. Without saying a word Anya walked past them. The closer she got the more familiar the carousel became — it looked exactly like her music box — there was even a horse missing a front leg. “What is it?” asked Billy. It took Anya several seconds to realize that her brother was lost in the carnival. But for some reason Anya didn’t feel like searching for him anymore. “Oh?” She lingered for another moment, looking up. The first thing she saw was the Ferris wheel which towered far above any of the circus tents. It must have been at least a hundred feet high. “How about we look from up there,” said Anya. The line for the Ferris wheel moved forward swiftly. It was much bigger than Anya had thought, at least a hundred feet high. At the head of the line, an old mime carefully took each of their tickets and frowned heavily each time he ripped them in half. He said nothing, but his face was scrunched up in thought. Miranda climbed into the open carriage and sat down next to Billy, followed by Anya. When she was seated the mime pressed down on the lever with all his weight and the carriage wobbled into motion. Miranda screamed excitedly, wrapping her arms around Billy. There was nothing to see from horizon to horizon but tree stumps and the carnival. It appeared as though they were in the middle of nowhere. As far as they could tell there were no cities or towns, forests or seas. The carriage suddenly stopped, suspending them high above the crowd that appeared no bigger than a colony of ants. As the carriage descended, Billy was able to scan the crowds in search of Anya’s brother. He spotted a ginger boy beside Jester Thingrim. A surge of anger rose within Anya as soon as the carriage was at ground level. The boy with the ginger curls and crooked tiger mask froze and looked at her oddly as she marched toward him. With an angry bellow, Anya raised her hand in a threatening manner. The little boy cringed and hung his head in shame. As usual, Anya thought to herself, Todd always gets me in trouble. “Thank you for finding him Mr. Thingrim,” said Anya, and wrapped her hand tightly around his small wrist. “I’m not letting you out of my sight,” she hissed. A shudder went up her spine, Todd’s hand felt weirdly cold and clammy. “I told you not to worry,” said Jester Thingrim with a grin. He leaned in so close to Todd that his nose almost touched his. “Stay with your sister,” he hissed, playfully tapping the boy’s head. Then Jester Thingrim mounted his tricycle and rode away, laughing hysterically whenever someone had to jump out of his way. Todd immediately tried to pull himself from her gasp the moment Jester Thingrim was out of sight, but she was too strong. “What is wrong with you?” shouted Anya. She desperately tried to keep a hold on him and get a firmer grip on his wrist, but he was literally slipping past her fingers. His eyelids flickered. Anya caught a glimpse of an unusual pair of black, round eyes. The boy flashed a look of panic and looked right into Anya’s blue eyes, and then bit her. The boy ran around and through every ride, circus tent and candy-stand as though he knew the carnival like the back of his hand. It only took him a few minutes to arrive back at the ticket booth. He made a fist of both hands and pounded on the door until the old women opened up. He lifted his mask and let it rest on top of his head. He tapped his long finger against his lip. Then he bent down and grasped a large brass ring, that was partially hidden in the grass. “You were right, I’ve got a new friend,” he laughed. Then he heaved the brass ring upwards, revealing a plank of wood covering a small square hole in the ground. There was a ladder that led down to a musky chamber. The young boy climbed down and tossed his tiger mask and orange wig onto the bed. He hurried to the back of the room and, with a firm grip, pulled open the heavy drapes that covered a large birdcage. “Hi, Todd,” he grinned.